As opposed to traditional 2 dimensional x-ray technology, 3D Cone Beam CT imaging has the unique ability to differentiate tissue types, significantly increase resolution and provide Drs. Petnuch and Moffa with the ability to see any area of your dental anatomy from any angle. Drs. Petnuch and Moffa can use this information to make accurate 1-to-1 measurements, identify potential problem areas and precisely plan any treatments. Within seconds of the PreXion3D scan, Drs. Petnuch and Moffa can present you with the 3D & MPR images, give you a virtual diagnosis, offer up a personalized treatment plan with the expected outcome all in one visit. The PreXion3D scanner offers your doctor enhanced accuracy, visibility and predictability. The results are a reduction in procedure, surgery and anesthesia time, which ultimately translates into a quicker and more comfortable recovery. Because we have a PreXion3D scanner in our office, you can avoid an extra visit to a radiology center or hospital. Plus, it does not require multiple consultation appointments, most treatment plans can be done in one visit. 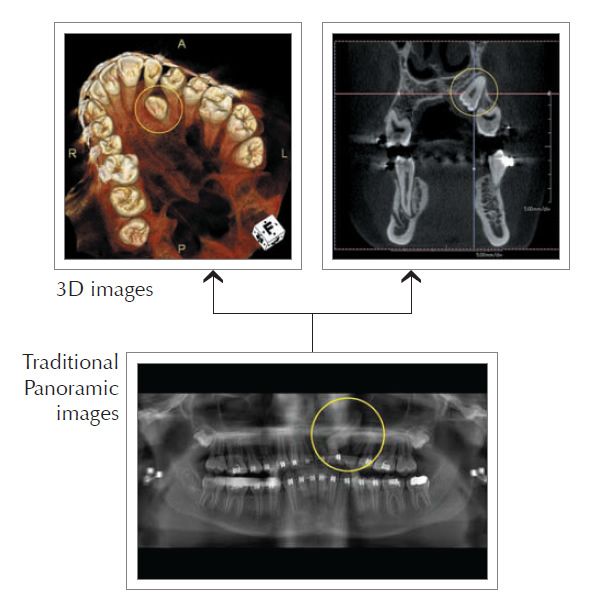 Traditional 2D Panoramic and other dental x-rays are limited when compared to 3D images that can show different angles and planes, allowing Drs. Petnuch and Moffa to view any part of your anatomy from any direction or angle.